A big Thank You to our group member Cats for suggesting this swap! You will have one swap partner which you will send one pen, one pencil and one pencil case. Overall you should spend about 5.00 US dollars for everything before shipping. The pen and pencil should be newly store-bought and will be sender's choice but try to find something fun, unique to your area, bizarre, silly, etc. 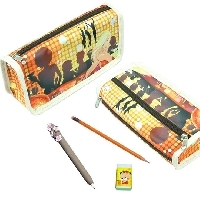 The pencil case can be as creative or simple as you like and will also be sender's choice. If you are crafty we encourage you to make the pencil case and below you will find a few of the free tutorials and patterns that can be found on the internet. The final product should be something that you would like to receive. If you are not crafty it is just as acceptable to purchase a pencil case. Rules are that you have to be in the group, have done at least 5 mailed swaps, have no unexplained or recent ones, and have your profile filled out. Please ask questions, this is the first "crafty" swap I have hosted and I may have forgotten one or two details. If you know of any great free patterns/tutorials on the internet for pencil cases please post the link in the comments section below. How do we find out how many 'mailed' swaps we've done? @pasiakowa and @willow you are have more than enough swaps, thanks for joining the swap! Anna, can we do a pencil box and decorate it? Pencil boxes would be great too!